2 Days to a Clean Diener Home – That’s Neat! Oh my, where has summer gone!? Who knows. Who cares! I finally have a weekend of no obligations and nowhere to be! Normally I would take this opportunity to do some extra relaxing but that just can’t be the case. After the basement flood in June, a super busy July and now Brandon gone for August – the house chores have been side lined and there is much to be done. This house ain’t gonna clean itself. So, I have created my 2 Days to a Clean Diener Home Personal Challenge. Oofta! There you have it. I’ve got a full weekend ahead of me but once I start I can plow through these tasks quickly. With busy lives it’s easy to set your things down and go about your night – this is what creates the clutter. While I clean, I will take time to find better organizing solutions that fit OUR needs. What can I do to make separating the mail, picking up toys and cleaning the toilet “fun”? 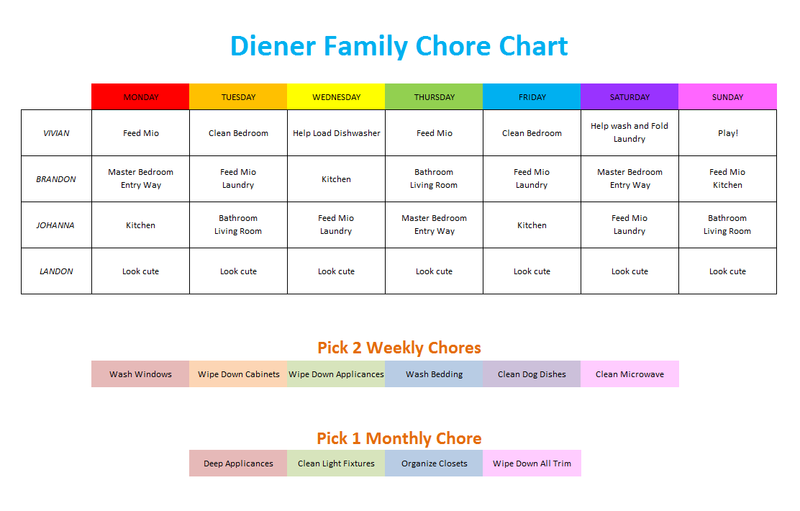 Meanwhile, I created a weekly cleaning chart for the family. If each of us pitches in 20 minutes a night when we get home we will create an enjoyable space to share. It’s nothing elaborate but it doesn’t have to be! Print it off – throw it in a frame and mark things off with a dry erase marker! Easy enough to make yourself but I’ll put a link below the picture to download the excel file.